Huh? Encouragement as discipline? But encouragement is positive, and discipline is negative, right? Nope! Discipline is teaching and guiding. It doesn’t mean being angry, upset, or even disappointed. It means you are guiding your children in the direction they should go. 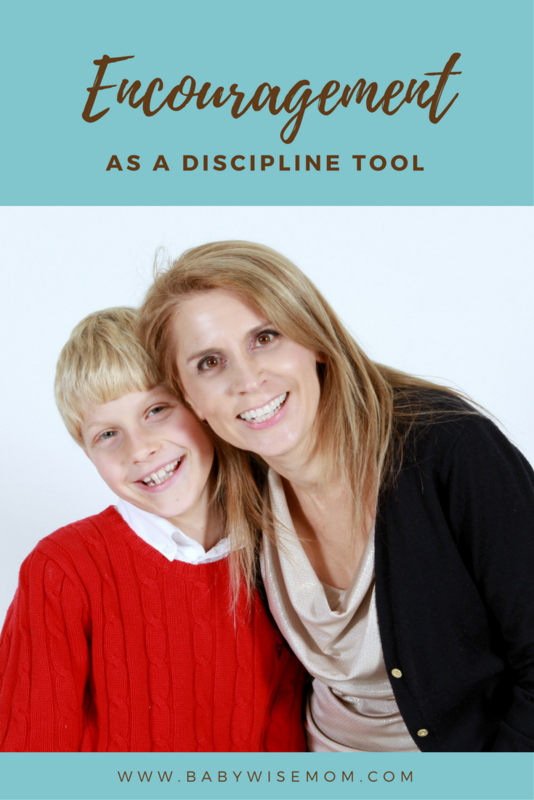 Remember last week when we talked about your example as a tool of preventative discipline? Encouragement is another tool of prevention. On Becoming Pre-Toddlerwise states, “…there is also the encouragement side of training which is always positive, affirming and serves to motivate” (page 117). What are some ways we can be encouraging? Thank your children for being obedient. Tell your child she did a great job at coming to you when you called her. Offer encouraging words when your child decides to be obedient. Do this even when you have had to remind her several times and when she is doing it begrudgingly. When my children are obeying in this manner, I often thank them with a twinkle in my eye and I exaggerate the thanks. This often makes them giggle and snap out of the bad mood and into a good one. Your child will often do kind things or right things without you having to instruct her to do so. Recognize these moments. Offer her encouraging words, give her hugs, thank her, and/or talk about how that makes her feel inside. Help your child to recognize that choosing correct behavior leads to her feeling happy inside. Whether your child tried to control her temper but failed, or worked really hard to sweep the floor (and did a great job or a job you might expect from three year old capabilities), recognize the effort that was put into it. “I could tell that you really tried to not yell. That was good work.” Then you can talk about ways she can be more successful next time. “Thank you for all of your work in sweeping the floor. You worked really hard.” And don’t go on behind her and pick up all that she missed. When you are encouraging and focus on the positive, your children will want to be even better. They will work harder and put more effort into doing the right thing. That is why I will often thank for obedience even when it is not with the best attitude. They are children after all–adults get grumpy and stomp around why would a child be any different? A way a child is different is in the ability to snap out of a bad mood quickly, and focusing on the positive helps them do that. Once the attitude is improved, you can sometimes point out, “Isn’t it much nicer to be in a happy mood than a grumpy mood?” Most of the time, however, let experience do the teaching. Previous Post ANOTHER Sleep Training WINNER! great post! And totally agree especially if their love language is words of affirmation. but i have found giving some positive feedback works wonders and instills in them the desire to improve. i think often we can overlook/forget this (myself included) but it really makes a big difference! Great post! Good reminder! One of my twins, 14 months, really tests me and is disobedient often. I needed this one! You are all welcome! Thanks for your comments.